Christian Community Caring for Defence is no mere slogan, but action on the part of a growing group of men and women who daily show their love for our Defence personnel. At the end of 2017 and beginning of 2018 REP Warren CLARKE undertook a 4 month overseas deployment serving the Defence Force. He is far from all he is used to, being one of our valued staff at Kapooka. Like all Christians called to the mission field, our REPs depart from family and loved ones when they volunteer for 4 months without pay, to serve the ADF overseas. 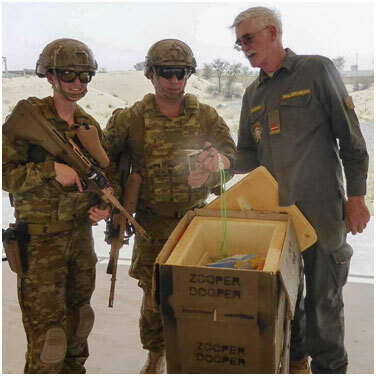 Their love for ADF members shines through their dedicated service and the Defence Force continually asks for Everyman’s REPs to be part of an on-going component of their Overseas Operations. Sadly we cannot always send REPs due to the fact that they do not have the financial wherewithal to attend to this vital mission. To that end we have initiated MOSES; Missions Overseas – Sponsorship Encouragement Scheme where you can partner in this extraordinarily important venture with us, to make more REPs available to serve on Overseas Mission without the concern of financial pressures at home. Please consider how you might be involved in MOSES, and in so doing, share in the tremendously satisfying goal of supporting this nation’s finest, who put their lives on the line for our nation and country. Everyman’s is currently engaged in overseas mission serving the Australian Defence Force in the various areas they deploy. This gives our Everyman’s and Everywoman’s REPs opportunity to minister to ADF members when they are away from loved ones, and sometimes afraid in an unfamiliar environment where the big questions of life are often prompted. What better place for the Everyman’s REPs to be, as we offer counsel, comfort, and the much loved refreshments in the form of a cold drink, an ice block and a snack? Most important is the smiling and friendly Everyman’s face, always willing to sit down and listen to any problems or concerns an ADF member may have when they are far away from home. During our REPs time overseas, financial requirements at home still need to be met and in some cases family needs to be supported. You can elect to sponsor one of our overseas missionaries to assist with their personal financial needs while they are away. We invite you to share in our Overseas Missions supporting our REPs overseas in your prayers, financially through a one-off gift, or sponsorship for the period of deployment (4 months).